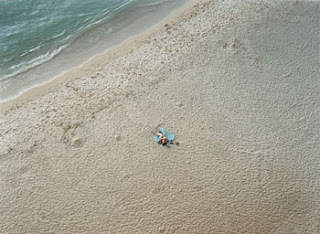 From 2001 to 2005, Misrach made a series of large-scale photographs of swimmers and sunbathers in Hawaii that he titled On the Beach. Shooting from an upper floor of an oceanfront hotel, he eliminated all references to the horizon and sky in order to record people immersed in the idyllic environment. Yet despite the beauty of the scene, a strange sense of disquietude pervades these photographs: Lone swimmers are often presented without reference to the shore, as if drifting far out at sea, while groups of waders frequently appear to be fleeing some unknown danger. And even those on the beach can look drowned and washed ashore. Simply put, the photographs are phenomenal - and huge. One is even six feet by ten feet. The pictures on the web like the one above do not do these works of art any justice. Standing in front of them you do get a sense of man's utter "smallness" in the world and a strange feeling of loneliness and insecurity. And that is exactly what Misrach was trying to portray. He began the project shortly after September 11 and wanted to capture the mood after those stunning events. Misrach has written: "My thinking about this work was influenced by the events of 9/11, particularly by the images of individuals and couples falling from the World Trade Towers." Misrach told us that he was in Washington, DC on 9/11. Disoriented like the rest of the nation, he headed back home to the West Coast and out into the desert, a location he has made a career of photographing. Not able to find a subject that fit his mood, he decided to continue with a pre-planned vacation to Hawaii where he found the inspiration he was looking for. None of the nineteen images are posed and none of them have names, though Misrach said he has given them nicknames such as "Handstand" and "Falling Girl." He is right that naming them would take away from their power and influence on the viewer. Instead, he wants his photographs to be "Rorschachs" that allow each person to feel something unique and personal while gazing at these images. Like so many works of art, the best thing to do is just go and see them for yourself. At the National Gallery through September 1. For more information, click here. 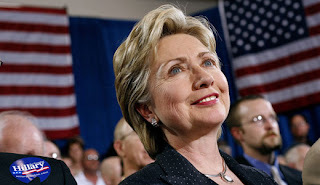 June is only a few short days away and, by most accounts, will be the final month of Hillary Clinton's campaign for the White House (barring any VP nod). However, while she hasn't yet pulled out of the race for the top slot, pundits and commentators have already started to assess her campaign's legacy. Here are two of the most interesting I've come across. One is fairly positive, while the other is...not so much. "The Highest Road" (Anna Quindlen in Newsweek, May 26, 2008): "Senator Clinton is the most prominent woman in America. She needs to think outside the hermetically sealed bubble of her campaign and begin to develop a strategy now for the way in which she wants to use that: to unify the party, to galvanize her base of voters, to make certain the Democrats prevail in November and perhaps to play a powerful leadership role in government in the years to come." It is important to remember that while there are so many unpredictable components to an election, the candidates can control one thing - their tactics, behavior, and character during the contest. Let's hope that the "better angels" are in play for the general election - it's what America deserves. For more information about the Index, click here. It's a pretty interesting read - hopefully there will be enough funding and interest to make this an annual report for years to come. Ouch. For those of you outside the DC area, -- Trains are what I like to call "phantom trains" - sometimes they come on line, other times they won't pick up passengers and just speed on by. So it looked like I was in for an 18 minute wait. Grunting, I sat down on a bench and was joined by two other commuters. Another guy on a Blackberry came over and asked about the -- Train. "50/50 chance it will pick us up," I said. From there, the ice was broken. While we waited, the four of us chatted about the sad state of the Metro system, the NBA Playoffs (the guy next to me was concerned he would miss the game unless the train showed up soon), the presidential primaries (with updates from the Blackberry guy), and the impact of racism on American politics. On May 25, the National Gallery of Art's newest exhibit, "Afghanistan: Hidden Treasures from the National Museum, Kabul," will open to the general public. I was fortunate to get a sneak-peak this morning when the museum opened its doors to the press for a preview of the exhibit and the 228 artifacts on display that date from 2200 BC to the 2nd century AD. These pieces include bronze and stone sculptures, gold jewelry, and painted glassware that demonstrate "a synthesis of Greek, Roman, Persian, Indian, Chinese, and Siberian styles," a result of the country's centralized location on the famed Silk Road. They truly are the crown jewels of Afghanistan. First came the Soviet invasion in 1979, followed about ten years later by a furious civil war that reduced much of Kabul to ruins. As Afghan warlords battled for control of the city, fighters pillaged the national museum, selling the choicest artifacts on the black market and using museum records to kindle campfires. In 1994 the building was shelled, destroying its roof and top floor. The final assault came in 2001, when teams of hammer-wielding Taliban zealots came to smash works of art they deemed idolatrous. When they finished, more than 2,000 artifacts lay in smithereens. Throughout those dark years, Massoudi [the director of the National Museum of Afghanistan] and a handful of other museum officials kept quiet about the hoard of museum artifacts - among them the crown jewels of Afghanistan, the famed Bactrian gold - that they had hidden in vaults under the presidential palace in 1988, as the Soviet occupation gave way to civil war. Researchers the world over despaired of ever seeing the objects again, thinking they'd been sold piecemeal into the illicit antiquities trade or destroyed by the Taliban in their final, iconoclastic frenzy. By October 2003 - more than two years after U.S.-led forces toppled the Taliban regime - most of the key holders had disappeared or had fled Afghanistan. Massoudi felt it was time to see if the objects had survived the war. When a team of locksmiths wrenched open the safes that month, every last piece of the Bactrian gold was there, trussed in the same tissue paper in which the museum staff had wrapped it. Five months later, researchers opened a set of footlockers stashed in the same underground vault and made another jaw-dropping discovery: priceless 2,000-year-old ivory carvings and glassware that had been excavated in the 1930s from a site known as Begram and given up for lost. Massoudi's staff had cloistered those away too, and they were remarkably well preserved. So if you are in the DC area between May 25 and September 7, make sure to check out the exhibit. For more information, click here. It will also be traveling to San Francisco, Houston, and New York. It is an amazing story out of a country that has suffered so many setbacks over the past few decades. A banner hangs outside the National Museum in Kabul that reads "A nation stays alive when its culture stays alive." There's hope yet for Afghanistan. Tomorrow night, the Goethe-Institut Washington is screening Gillo Pontecorvo's 1966 film "The Battle of Algiers" as part of its "Revolution is in the Streets: 1968 Film Series." Shot in semi-documentary style, this film is truly a work of art and is a must-see regardless of your political leanings. Though it portrays events from the Algerian War of Independence from 1952 to 1960, there are many similarities that can be drawn between that conflict and the current ones in Iraq and Afghanistan. The Pentagon even screened it for their staff in 2003 to put the events in Iraq in context. For more information about the program, click here. He beats cancer and pitches a no-hitter. A real-life Iron Man (and without the CGI). Growing up, I spent my summers working for my family's business on the Jersey Shore. For years, Irish students would come over on the J-1 visa to work in the hotels, restaurants, bars, and arcades in the area. Many of the guys would bring over the jerseys of their favorite soccer clubs and one in particular caught my eye. It was the white and green "hoops" of the Scottish club Celtic who played in Glasgow. I had always enjoyed soccer as a kid, but talking to the Irish kids about Celtic and their storied history, I really took to the team. Some might say it even had a (small) influence on my decision to go to Ireland for my junior year abroad in Dublin. I quickly learned about Celtic's long and lethal rivalry with their cross-town rivals, the Rangers (boring jersey below). For Americans it is difficult to understand the complex and deep-seated rivalries that exist in the soccer world. Sure, we have had Red Sox-Yankees, Eagles-Cowboys, Michigan-Ohio State, and Lakers-Celtics, but soccer rivalries many times bring competition to a whole new level. (Check out Franklin Foer's How Soccer Explains the World for a good, though very basic, introduction to the politics of the game. It's good beach reading). Anyhow, the Celtic - Rangers rivalry stems not only from the fact that both teams are from Glasgow, but that historically, Celtic draws it support from Catholics (hence the Irish connection) and Rangers from Protestants. So think Red Sox - Yankees with hundreds of years of bigotry and sectarianism thrown in. It's often not a pretty sight and nothing to be romanticized when fans clash in and outside the stadium. So while I in no way condone the hooliganism that sometimes breaks out when these teams meet up, I can't help but say "stupid Rangers fans" (that's the PG version) when I saw this footage of them running wild and fighting police on the streets of Manchester, England following their team's 2-0 loss to Zenit St Petersburg in the UEFA Cup final last week. Shameful. For a more light-hearted, though vomit-inducing, take on Scottish hooligans, take a trip down memory lane to Mike Myers' skit on SNL. Strangely enough, the scarves they are wearing are of English clubs. Artistic license, I guess. 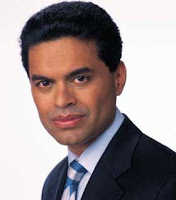 What do Fareed Zakaria and the Red Sox have in common? Well absolutely nothing as far as I know. (However, Zakaria did get his Ph.D. from Harvard, so he may have gone to games while in Boston. But he has settled in New York City with his family, so who knows if he's a fan.) Anyhow, I've been meaning to write a couple posts this week, but haven't gotten around to them until now. So why not lump them into one post? There's no rules in the blogosphere, right? First, the Sox. I took the afternoon off on Wednesday to head up to Baltimore for the second of a two game series against the Orioles. Start time - a bizarre 3:05. These trips to Baltimore when the Sox are in town have become an annual tradition, and given the fact that seeing the team play in Fenway is about as difficult as winning Powerball, it's best to see them on the road. Looking at the number of Sox fans that show up in Camden Yards (aka "Fenway South"), proves many others have the same idea. The Orioles fans are never pleased to watch the sea of red and blue enter their home turf, though. And this time I did see a few fans get into a scuffle. Something about someone pouring beer on another guy. At 6 dollars a bottle, that's just bad economics in my opinion. The game was good for six innings until middle relief came in and blew it with a grand slam by Jay Payton (a former Sox himself). But Manny did make a great play in the outfield - and high-fived a fan after making the catch - before turning a double play. (Can this at least put to rest all the critcism of his fielding skills?) So it was a small victory on an otherwise medicore performance overall by the team. But there is no question that the Sox are in a major slump going into this weekend's interleague play against the Brewers. Still, I'm looking forward to heading up to Baltimore again for the weekend series at the end of May. Now on to Zakaria. I went to Brookings on Thursday to cover the discussion of his new book The Post-American World. I haven't yet gotten to reading it yet, but given the huge media coverage of it (book reviews, TV appearances, and a cover story in Newsweek), I feel I've gotten a pretty good feel for the thesis. Which in a nutshell is this: A post-American world doesn't mean the tragic decline of the United States, but rather the rise of other powers in the world such as China, India, and Brazil, creating more centers of power than ever before. The US will still dominate the scene militarily, but in terms of economic and cultural influences, the rest of the world is catching up. Outsider Exclusive! Is Hillary Moving Out? The closest I have been to participating on a political campaign this year is by living near Hillary Clinton's national headquarters in Arlington, Virginia. I walk by the building everyday which - go figure - used to be an immigration and naturalization office. It's probably the ugliest building on the block and will probably be knocked over when Hillary moves out. Which may be sooner than you think. Though the polls are still open in West Virginia today and Hillary is expected to have a big victory there, it seems the cards (and the math) are stacked against her for winning the nomination. Hillary says she will keep on truckin', but for the past week, there have been two Budget rental moving trucks parked out back. (Thank you Tatiana for the pics!) Call it wild speculation or a case of unsubstantiated evidence, but I wouldn't be surprised if Hillary in fact is ready to pack it in and get out. I've had quite a few interviews since the fall for various job openings throughout the city. Some were better than others. And as I'm still looking for my "big break," I am no expert on the ritual. But if there's one thing I learned during this job hunting process, it's this: If the person interviewing you drops the "F bomb" during the interview, you're not going to get the position. Trust me, it's happened twice already. These were two different interviews with two different professional organizations. And on both occasions, I felt the interview was going great. There was good conversation, a little laughter, eye contact, head nodding – all the ingredients of a good interview. During the first one, everyone was so relaxed and comfortable that the two staffers interviewing me were tossing around the f word like it was a preposition. It felt like happy hour in Adam's Morgan. (I refrained from joining in, naturally). And the whole time I was thinking, "Yeah, they really like me. We're meshing. I'm practically part of the team already with all this banter." Next week I received an e-mail that ends with thanks for your interest and we "wish you great success in your future endeavors." Ouch. Not a happy hour for me. And then it happened again last month. This time the interviewer was talking about the former co-worker who had the position I was applying for. And there's the F-bomb again, this time to describe the previous person's work ethic. And again, I think, "Yeah, they love me. I'm already included in the workplace gossip circle." I was told I would hear back from them the following week. Still haven't heard a thing over a month later. So while I can say that you probably won't get the job if you say "f*ck" during your interview (unless you are applying to be 50 Cent's bodyguard), I guarantee you that if your future employer says it, you didn't make the cut. And that's a f*cking shame. Summer is almost here. Which means warm weather, tourists, sitting by the pool, and ridiculous commercials imploring us to go to Six Flags. This year the good folks at Six Flags have decided to hire some guy to scream at us about how much fun their amusement park is. And compared to sock puppets, it does seem like a lot of fun. But I'm curious, though. We've seen both "1 Flag" fun and "6 Flag" fun. What about 3 Flags or 4 Flags? There's got to be some fun somewhere in the middle that doesn't cost $49.99 plus gas, food, and drink, right? Was this worthy of a post? Probably not. But it's Monday and the energy is lacking. Still, turn it up LOUD!